Kelly M. O’Brien and Angel Greenham, The Cells residency, installation view. ©2018. September was a month of school-focused commitments, plus a bit of jail cell magic sprinkled into the mix (no, I didn't commit a crime). As Year One of my 2-year MFA caps off with an Interim Show to mark the occasion, I've been juggling assessment (grading) deadlines, a short residency, preparing for Affordable Art Fair Battersea, and the start of a new term. Kelly M. O'Brien, You're Not Coming Back, Are You? Paper, wood, thread, rosin. 170x59x8 cm | 67x23x3 inches. ©2018. Hard to believe, but I am finished with my first year of a 2-year MA Fine Art degree, capping it off with an Interim Exhibition and a fat research binder to back it up. This first year has been such an eye-opening, fulfilling experience and I can't wait to see what the second year has in store. More details and images of my work are on my blog. Art school colleague Fiona Campbell and I did a BBC Radio Bristol radio interview about the exhibition, which you can listen to here until 22nd Oct. (starts at 40:25 and runs for approximately 10 minutes). 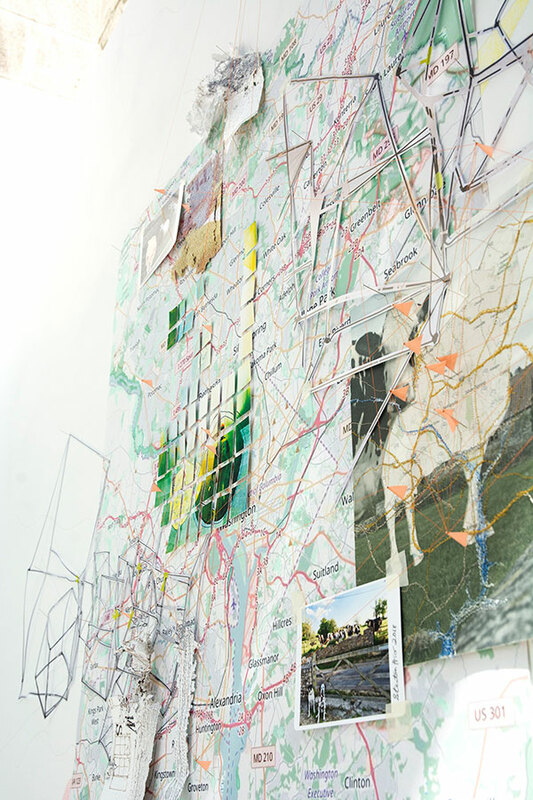 Kelly M. O'Brien and Angel Greenham, The Cells Residency (installation view). ©2018. This month I have been collaborating with artist Angel Greenham at Trowbridge Arts Centre as part of her summer residency in The Cells. We spent last week immersed in this fascinating space, creating unexpected interventions with found objects, juxtaposed materials, motion, and light. We opened briefly to the public this past Saturday, welcoming our visitors with Angel's housemade pavlova's and tea in proper china cups - a little magic to encourage voluntary lingering and conversation in a space that former occupants have otherwise passed time involuntarily in eras past. Our joint installation opens again to the public this Saturday (11 to 2) and Thursday 4 October (6 to 9 pm) if you're in the neighborhood. Details are below. Kelly M. O'Brien, Studio work in progress, detail. Paper, thread, tape, pins. ©2018. Life comes full circle sometimes, doesn't it? At the age of 19, I spent my Junior Year Abroad studying in Montpellier, France. Decades later, I am once again an international student at the Bath School of Art & Design. Granted this time, I live here in the UK, but I'm still considered an international student. Study International interviewed me recently as background for an article they wrote about international students at Bath Spa University. You can read the interview on my blog here. If you're in the neighborhood, go see Modern Art Buyer's booth in person during the Affordable Art Fair Battersea in London, 18 - 21 October. My work has been selected by the AAF curator as one of her Top 25 picks! MAB will be showing a combination of my original work along with a selection of hand-embellished prints for sale. Details below. Invitational Pop-up Installation in collaboration with Angel Greenham, The Cells Residency, Trowbridge Arts Center, Trowbridge, BA14 8EQ, 10 September - 3 October. Open to the public on 23 and 29 September, 11 am - 2 pm and 4th October 6 - 9 pm.